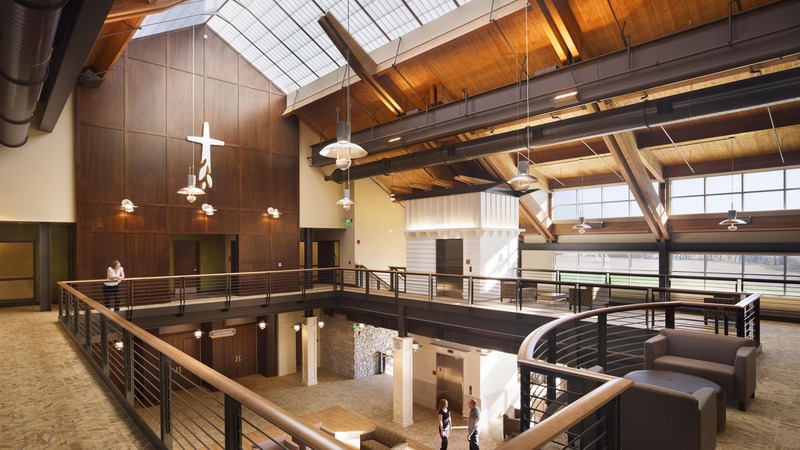 Following the visionary leadership of the Pastoral staff at Crossway Church, TONO Architects developed a facility master planning strategy carefully stewarding the church’s property near Millersville, Pennsylvania. Situated on 75 acres of rolling farmland, the plan conceives of a village of worship, educational, gathering, and administrative building components echoing the historic agricultural use of the site through the deployment of indigenous forms and materials. The first development phase includes a gathering wing featuring a 10,000-square-foot, multi-purpose worship and meeting space, three-story atrium volume, classrooms, and a bookstore. With a construction value of $7,000,000, the initial phase exhibits intriguing internal spaces meant for large and small group gatherings, intimate ceremonies, banquets, and large-scale performances. The facility demonstrates the church’s commitment to high performance, green building design through a multitude of resourceful strategies such as spatial flexibility, innovative environmental comfort systems, natural daylight techniques, and eco-friendly product selection. Measuring approximately 37,000-square-feet, the first phase provides for future expansion in the coming years as the church family continues to grow into its facility.